Will the introduction of PSBs improve financial inclusion in Nigeria? The key objective of the PSBs is essentially to enable high-volume, low-value transactions in remittance services, micro-savings and withdrawal services in a secured technology-driven environment, particularly in the rural areas. According to a World Bank report (the Global Findex Database 2017), nearly half of about 1.7 billion unbanked population in the world live in just seven developing economies: Bangladesh, China, India, Indonesia, Mexico, Nigeria and Pakistan. In a bid to drive financial inclusion rate upward, the Central Bank of Nigeria (CBN), on 23rd October, 2012 – in collaboration with other stakeholders – launched the National Financial Inclusion Strategy (NFIS) with a view to ensuring that over 80% of the bankable adults in Nigeria have access to financial services by the year 2020. In other words, the aim of the NFIS is for the financial exclusion rate of bankable adults in Nigeria to reduce to 20% by that year. As part of its strategy to achieve this target, the CBN has been promoting several financial initiatives in the financial system such as, microfinance banking, agent banking, tiered know-your-customer requirements and mobile money. Consequently, in a concerted effort to further deepen the financial inclusion rate (to consolidate ongoing efforts), the CBN, through the draft Guidelines for Licensing and Regulation of Payment Service Banks (PSBs) in Nigeria (the proposed Guidelines), is proposing the establishment of PSBs in the financial system. PSBs are expected to leverage on mobile and digital services to boost access to financial services for low-income earners and the unbanked segments of the population. The key objective of the PSBs is essentially to enable high-volume, low-value transactions in remittance services, micro-savings and withdrawal services in a secured technology-driven environment, particularly in the rural areas. It is proposed that PSBs will operate mostly in the rural areas and unbanked locations with not less than 50% physical access points in “rural areas” as defined by the CBN from time to time. They can also establish Automated Teller Machines in some of these areas (Clauses 3(i) and (ii) of the proposed Guidelines). PSBs are also at liberty to operate through banking agents in line with the CBN Guidelines for the Regulation of Agent Banking and Agent Banking Relationships in Nigeria (Banking Agent Guidelines) and use other channels, including electronic platforms, to reach out to their customers. The proposed Guidelines require PSBs to establish coordinating centres in clusters of outlets to superintend and control the activities of their various access points and banking agents. PSBs are further required to be technology-driven and to conform to best practices on data storage, security and integrity. In addition, PSBs are also required to set up consumer help desks at their main offices and coordinating centres to attend to consumer-related issues. iv) Invest in Federal Government of Nigeria and CBN securities and carry out such other activities as CBN may from time to time prescribe. iii) Establish any subsidiary except as prescribed in the CBN Regulation on the Scope of Banking and Ancillary Matters, No 3, 2010. The nature of persons permitted under the proposed Guidelines to act as promoters of PSBs are: banking agents (within the meaning of the Banking Agent Guidelines); telecommunications companies through their subsidiaries; and supermarkets/retail chains. Furthermore, Mobile Money Operators that intend to convert to PSBs are required to comply with the requirements of the proposed Guidelines. However, CBN may from time to time, consider the eligibility of other entities as the above list is not exhaustive. i) Minimum capital: N5 billion. ii) Non-refundable application fee: N500,000. iii) Non-refundable licensing fee: N2 million. 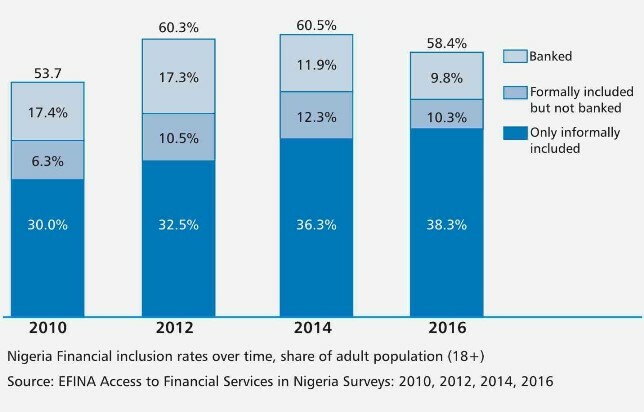 According to the CBN, as at 2016, only about 58.4% of Nigeria’s 96.4 million bankable adults were financially served and only 48.6% of all adults used formal financial services (CBN Exposure Draft of the National Financial Inclusion Strategy Refresh at page 6). This is a far cry when compared with South Africa, where 68% of the bankable South Africans used formal financial services as at 2012. This, therefore, shows that a large portion of the bankable population in Nigeria were unserved or underserved as at 2016. Accordingly, it is hoped that the introduction of PSBs into the financial services sector should go a long way in boosting the financial inclusion drive of the country. The proposed Guidelines give the CBN the power to determine rural centers and unbanked locations within which a PSB is required to have not less than 50% of its physical access points. However, the drawbacks highlighted below may militate against the full success of the PSB scheme. Firstly, technology penetration (particularly telephone and internet services), which is a major requirement to drive this financial inclusiveness in the rural communities in Nigeria (the target market), still falls below expectation. Throwing more light on this, Prof. Umar Danbatta, the Executive Vice Chairman of the Nigerian Communications Commission (NCC), had reported that over 200 communities that play host to about 40 million Nigerians still lack access to basic telephony services in Nigeria (The Guardian newspaper, 8th November, 2017). The NCC Chief further stated that Nigeria’s active internet connection stood at over 90 million as at 2017, which is just 47.44 per cent penetration (This is the case even though Nigeria ranked number one in Africa and 10th globally in the same year). In addition, current figures also show that less than 6% of Nigerians use handsets for mobile transaction (BusinessDay newspaper, 24th October, 2018). Also, according to a 2015 report released by the United States Central Intelligence Agency only 59.6% of Nigerians between 15 years and above are literate. Therefore, illiteracy, particularly in the rural areas, remains a conspicuous impediment to the full attainment of financial inclusiveness and the successful roll out of the PSB scheme. Furthermore, the proposed minimum capital requirement of N5 billion set by the CBN to establish and operate a PSB appears prohibitive and discouraging when compared with the minimum capital requirement of the other financial inclusion vehicles currently operating within the Nigerian financial services space. For instance, save for the registration of National Microfinance Bank that currently requires a minimum paid-up capital of N5 billion, the minimum paid-up capital requirement to operate a newly registered Unit Microfinance Bank is N200 million. A newly registered State Microfinance Bank requires a minimum paid-up capital of N1 billion (CBN Circular to all Microfinance Banks dated 22nd October, 2018). Accordingly, the prohibitive cost of setting up a proposed PSB may serve as a disincentive for investors hoping to invest in the scheme. Also, the nature of activities, which the proposed PSBs are permitted to carry on, are more restrictive than what is obtainable under the microfinance banking arrangement. For instance, while PSBs are prohibited from granting any form of loans, advances and guarantees to their customers, microfinance banks do not have similar restrictions. These restrictions may, therefore, make the PSBs scheme unattractive as investors can invest less and be able to achieve more by setting up a microfinance bank. A key consideration for the CBN to make the setting of PSBs attractive to Investors is to reduce the minimum capital requirement from the proposed N5 billion to about N500 million or N1 billion, depending on the nature of coverage of the PSBs. In conclusion, whilst the effort of the CBN in proposing this PSB initiative is highly commended as it is expected that it will help reduce the financial exclusion rate in Nigeria, investments in the PSBs scheme may be hindered if the critical drawbacks highlighted above are not resolved before the proposed Guidelines are finalised. Furthermore, considering that other cheaper financial inclusion initiatives of the CBN have been unable to drive up the financial inclusion rate to an expected level, it is left to be seen how this PSB initiative will achieve the 20% financial exclusion rate by the year 2020.